Kang Chae Young – the survivor. Home » BLOG » Kang Chae Young – the survivor. 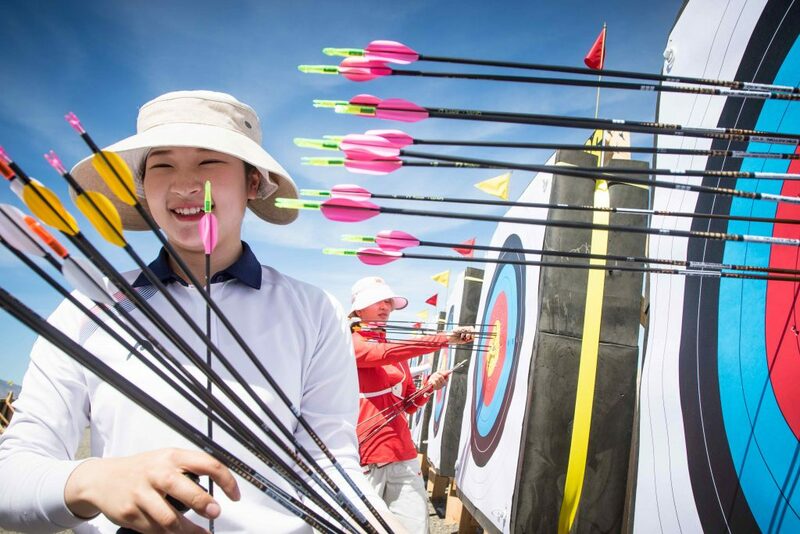 After breaking through with a triple-gold performance at Shanghai 2015 – which resulted in the World Archery media team giving her the nickname “The Destroyer” – Kang Chae Young had to suffer the agony of coming fourth in the Korean selection process before the Olympic Games last year. After the consolation prize of becoming world student champion last year in Ulaanbataar, she bounced back with an impressive performance in the national trials in March this year, placing second in the strongest field in the world. 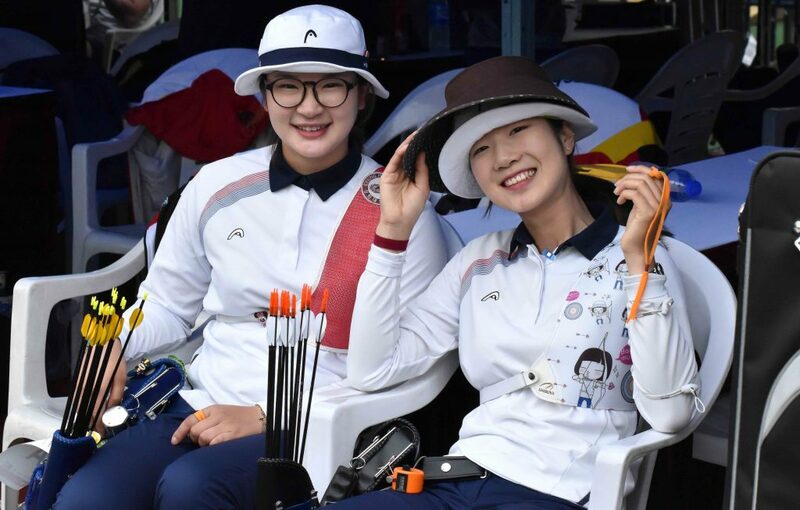 Shanghai didn’t go so well for the Korean recurve team, but she will be back in action at the Salt Lake City leg of the Hyundai Archery World Cup which begins this week on Wed 21st June. 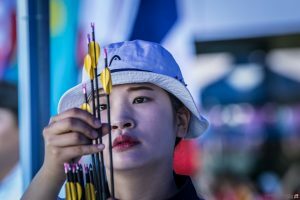 Chae Young had just turned 21 (although that’s 22 in Korean years) when we talked to her about the pressure of being on the Korean recurve frontlines. Tell us about your memories of your breakthrough in Shanghai in 2015. I only have positive memories from Shanghai because I had such a good result. It was my first time on the national team and being able to get out there and get medals was great. I’m very pleased and honoured to be on the national team again is nice but it feels like it’s been a long time, so I haven’t quite had time to adjust to the environment again.  You were one of the most consistent archers at the selection trials, and improved steadily through the three competitions. When did you know you’d done enough to go through? I’ve never really thought about that. I just wanted to be different from last year because back then, I shot with so much anxiety. This year, I could feel that I had improved a lot and just wanted to shoot more comfortably. I think I worried less and kept saying positive things to myself. I was better prepared. When I lift the bow, I need to lift it with confidence. When I do that, I’m able to shoot better. The documentary Game Of Numbers showed you going through the full range of emotions. 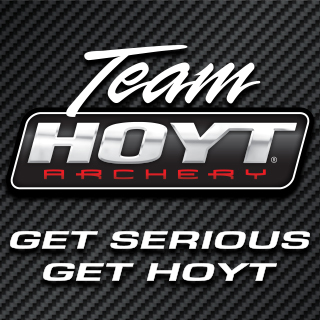 Are you a tougher person than you were last year? Last year I shot the entire national team selection and season with that sort of mindset. After not doing well at the Olympic team selections, the rest of the year was really difficult for me. Thankfully, I think because I didn’t do well at the selection, I’ve become stronger. My mind has become stronger. 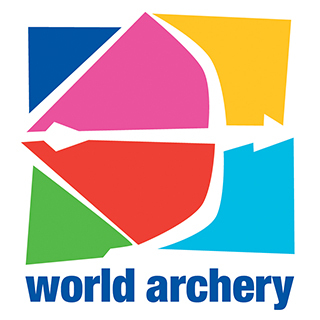 The archery finals in Rio were broadcast very early in the morning in Korea. Did you get up early to watch them? No, I was sleeping. (laughs). I already had a pretty heavy heart about the situation, so watching it would have been a bit uncomfortable. Of course I checked the results though. What World Cup stage are you looking forward to most this year? Germany. I’m really excited to go to Berlin. Who’s the team captain this year? Chang Hyejin. She’s the captain because she’s the oldest. What does she bring to the job? She’s such a positive person. Being positive and always having confidence. I can learn that from her. Will you be at the Universiade? You’re the reigning student champion. You must be the favourite? Who’s been your biggest influence recently? Our sport psychologist, Kim Myung Soo. When I went through a difficult time mentally, she was very helpful. Also, whenever I felt a lack of confidence, she reminded me to think positively through using notes. I read those notes before shooting during competitions. The Dreaming Attic, by Lee Ji Sung. [a book about lucid dreaming]. I like it because it talks about things coming true if you dream. I think everyone should read it. What advice would you give to yourself age 14? There’s nothing I can really think of. Maybe to focus a bit more when you’re shooting and to have a specific dream you want to achieve! I want to win the Olympic Games, Asian Games and World Championships. The triple crown, yeah! These days, I’m usually busy doing a student assignment or something like that. I also like making things so I make soap, and I enjoy reading. In 3 words? What should I say? Dreamer. Hard-worker. I like a challenge. Kang Chae Young was the subject of a longer interview last year prior to the Olympic selection, which you can read here. Thanks to Andrea Vasquez, Vanessa Lee and Kyung Hwan Choi for their assistance with this article. Have you seen her shooting in slo-mo? Here’s an awesome video – https://www.youtube.com/watch?v=e8Lf18vA2fA – no slo-mo tho, but you can always press slow in YT – and I do that and the elegance, focus, the godddamn precision! I love it!